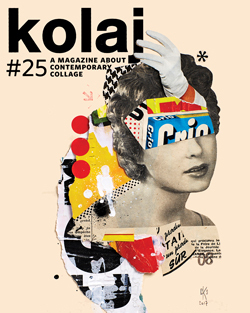 Kolaj contributor Claudia Eve Beauchesne profiles a prolific street artist in Issue Five. In 2008, I had just moved to Bushwick, Brooklyn, and I carried a camera everywhere I went to photograph the fresh tags and paste-ups that appeared almost every day on the walls of my new neighbourhood. Over the next few weeks, I began to notice pieces by a street artist known as Dain. His work was simple back then and it didn’t involve collage yet; just black and white portraits of Old Hollywood stars like Joan Crawford and Anna May Wong, blown up to the size of movie posters and pasted onto brick walls with a wash of green across the face and bright pink or orange spray paint dripping under the eyes. Sometimes five or six variations on the same image would be arranged in a grid like Andy Warhol often did. 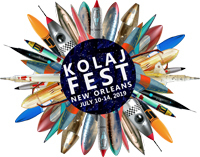 This was street art for history buffs, referencing the hand-tinted daguerreotypes of the late 19th century, the golden age of Hollywood cinema, 1960s Pop art and 1980s graffiti. Like most street artists facing the threat of arrest for vandalism, Dain works under a pseudonym in order to remain anonymous. There is little information available about him and he has given only a handful of interviews in which his short, vague answers left ample room for interpretation. However, several sources confirm that he was born in Brooklyn. 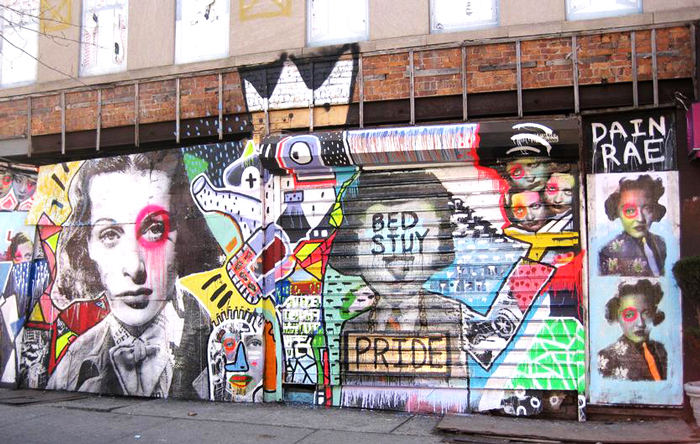 In 2009, I stumbled upon his first solo exhibition at the (now-defunct) Brooklynite Gallery in Bedford-Stuyvesant. The gallery had been turned into a wood-paneled 1950s-style parlour, complete with a settee, cut flowers, a chandelier and an old-fashioned rotary phone. On the turquoise walls hung explosive post-modern portraits of Elizabeth Taylor, Ava Gardner, Bette Davis and others in ornate wood frames — a riot of black and white photographs and candy-bright paint. The décor enhanced the work and vice versa, celebrating a bygone era that never really existed. Now that his pieces were intended for gallery walls rather than public ones, eliminating the need to work quickly and covertly, Dain had begun to produce more complex mixed-media works that combined collage, décollage and silkscreen printing with pen, pencil, brush and aerosol embellishments. 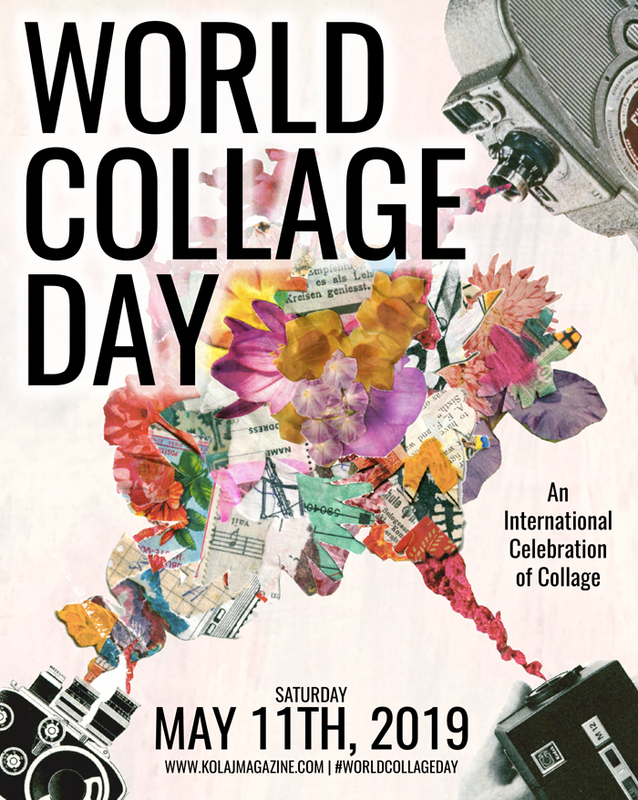 These new pieces (and those included in subsequent exhibitions in Miami, Chicago, Portland, London and Paris) still borrowed from Pop and graffiti, but with the introduction of collage techniques, they also evoked Victorian photocollages and the feminist photomontages of early 20th century Dada pioneer Hannah Höch. Like Höch, Dain often pastes the heads of his women onto the body of a man, creating androgynous characters that transcend gender stereotypes. Their perfect makeup and pin curls exude glamour while their neckties, suspenders and three-piece suits mean business – or is it the other way around? But while Höch’s photomontages were instruments of resistance and activism, appropriating imagery from the mass media to critique the dominant ideology of her time, Dain appears to be a formalist. His work addresses our society’s obsession with beauty and fame (particularly in more recent pieces featuring current stars like Angelina Jolie and Adele, and imagery culled from fashion advertisements), but he seems more concerned with the spatial relationship between the pictorial fragments than with the symbolism of their interactions. Moreover, his subjects’ facial expressions are either knowing and confident or noticeably studied, one eye often accentuated by his signature “dripping monocle,” which sometimes drips upwards. His are empowered women for whom femininity is a multi-layered construct that sometimes involves performance. 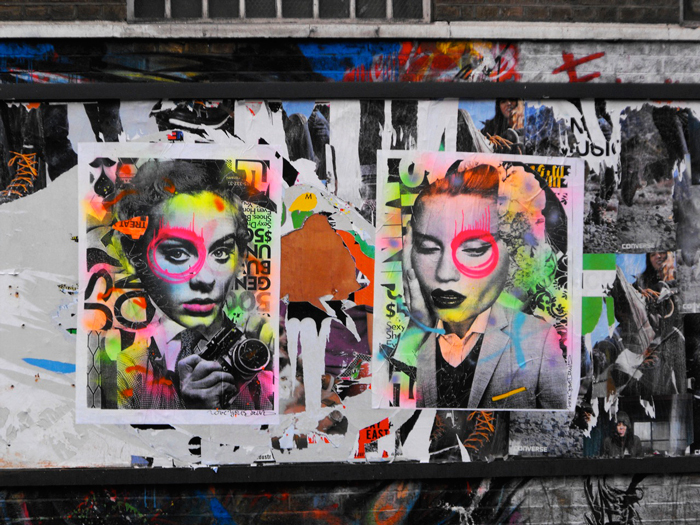 Although Dain’s work has been exhibited in galleries around the world, he still installs paste-ups on the streets of New York and other cities on a regular basis. He now makes photomontages ahead of time, pasting them up and adding only a few finishing touches on the spot. Because those pieces have been scanned and printed, they no longer have the edges, seams or texture of his original collages, but they retain their dynamic quality. On the street, Dain’s work connects with a wider audience, interacts with the fashion advertisements that provide some of his source material, and forms a dialog with the city’s architecture and with the work of other artists. In this context, his paste-ups become stronger and more meaningful when they have been partially ripped off of the wall, covered with tags and stickers, or installed next to a piece with a complementary colour scheme or sensibility. Two summers ago, I was walking down the street where the Brooklynite Gallery used to be when I noticed two men wheatpasting and spray painting the boarded up storefront. They both wore masks and seemed engrossed in their work so I didn’t interrupt, but the next day, I went back to find an amazing mural (image above). It was a collaboration between Dain and an artist known as RAE, who has also made the transition from the street to the gallery and back again. Dain’s larger-than-life Greta Garbo was surrounded by RAE’s geometric abstractions, with some radiant lines à la Keith Haring and a giant crown (perhaps an homage to Jean-Michel Basquiat) atop the mural. By playfully quoting images, processes and symbols from various periods of art history, Dain looks back to look forward, inside and out. To see more of Dain’s images, purchase a copy of Issue Five or subscribe.